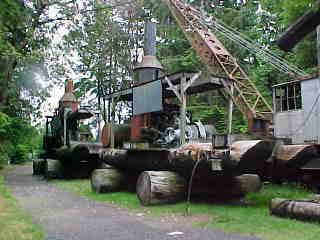 Camp 6 is a fantastic logging museum at Point Defiance Park in northern Tacoma. 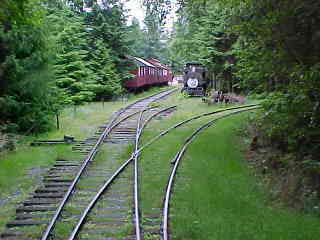 They have a small railroad with a loop of track that operates on the weekends. 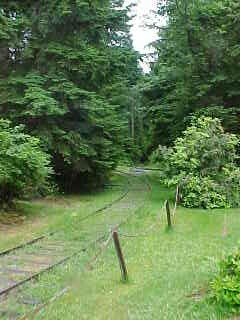 I had always wanted to visit and ride this unique Point Defiance, Quinault and Klickitat Railroad logging train ride. 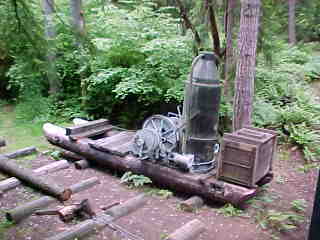 Knowing for once that I had a car, I e-mailed Camp 6 about two months before this trip. 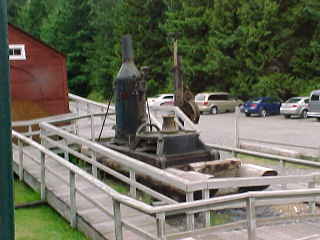 I received a reply the day I was going to leave from Rick Bacon, General Manager Camp 6 Logging Museum. 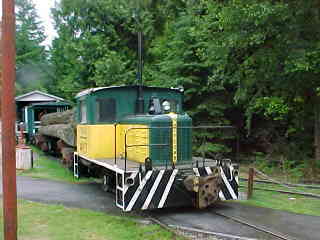 At Banks, I called Cliff Chapman who scheduled a special train for me to ride on Friday at 10:00 AM on June 9th. 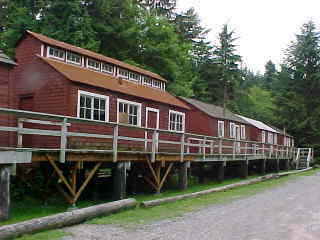 I told several people about this trip on the POTB run on Tuesday and told them to meet me at Camp 6 Friday at 10:00 AM. 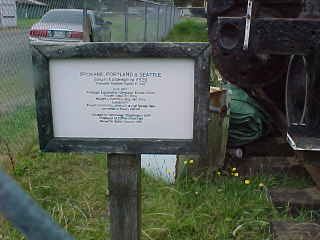 When we pulled into Camp 6, I found Elizabeth Davidge, Philip Kondziela. John Pennington and Rick Bleak waiting for us to arrive. 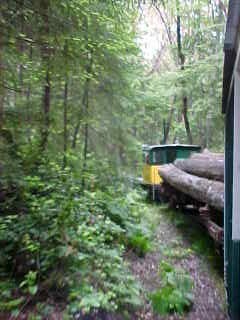 I met our crew who pointed me the right way to buy tickets for this unique train ride. 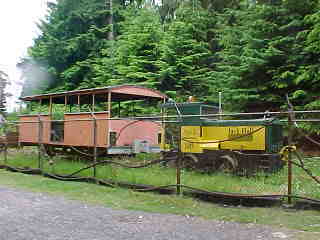 We all then boarded the train, which had a Whitcomb engine, a log car and a covered open car. 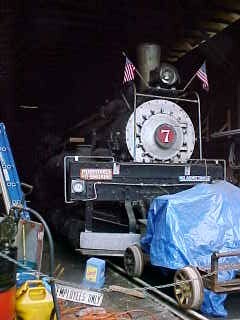 A picture of Shay 7 in their engine house. 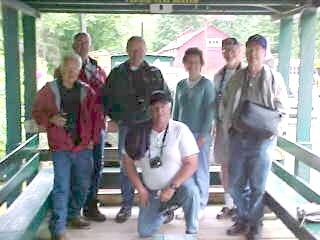 I shot a picture of our group of special train riders this morning. 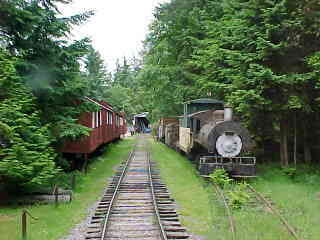 The train ran by a logging train on the right and Camp Housing on the left. 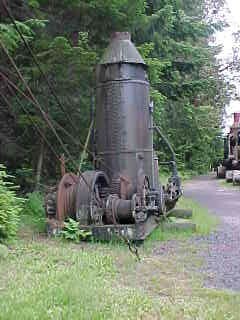 The loop begins with this switch. 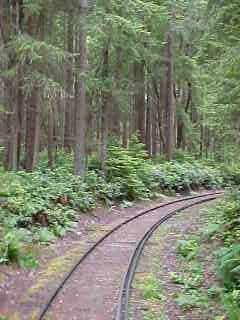 Our train was now running through the woods. 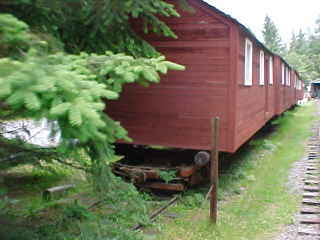 Another view of our train. 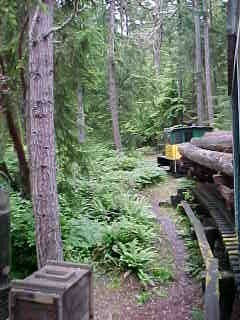 Our train crossed a low wooden trestle..
We ran by a Northern Pacific Log Car with a load on it. 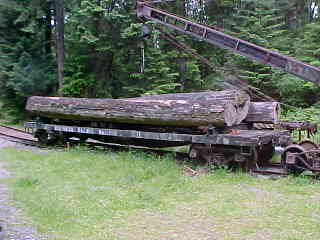 Next, we passed the Lidgerwood Skidder, which hauls logs off a hill up to a quarter mile at the rate of 15 to 20 MPH. 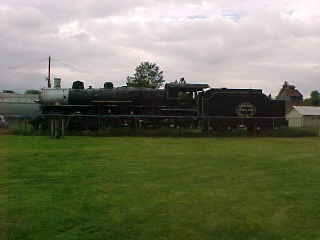 We then ran by a tank steam engine. 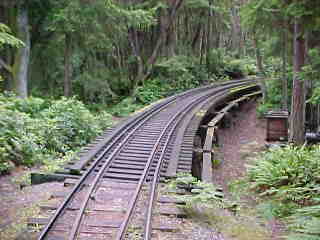 After we completed the loop, we went around a second time. 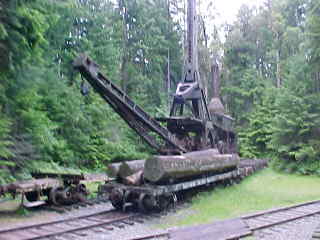 After our second trip, we backed into the station area. 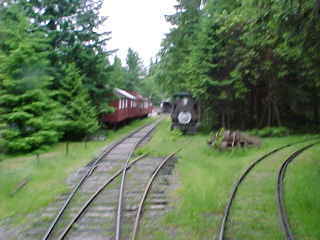 The Camp Cars ride on railroad wheels. After we finished our ride, we gave our train crew a hearty thank you for such a special trip. 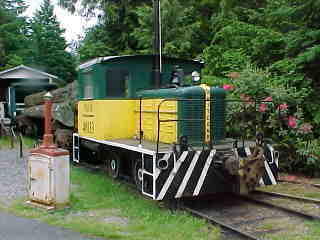 We wandered the grounds of the museum and saw a Rayioner Caboose. 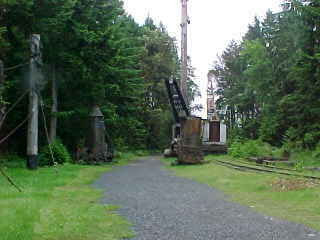 I took pictures of the wye track which they use to turn equipment to even out the wheel wear. 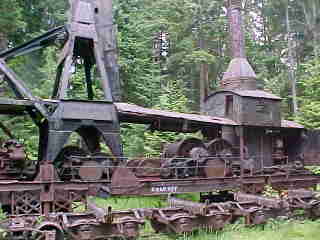 Another view of Shay 7. 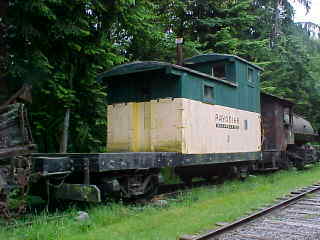 Additional rail equipment behind the engine shop. 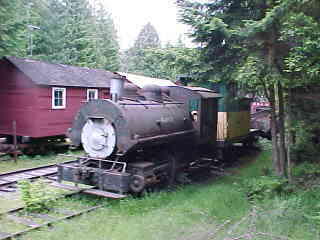 Later, back at the train our Whitcomb switcher that had pulled our special train. 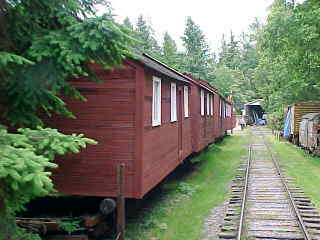 A different view of the Camp Cars. 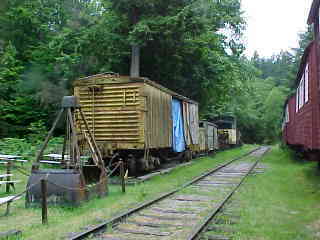 Box car and the Fire Train, etc. 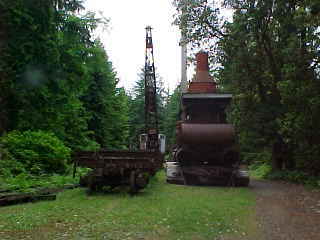 After looking around, seeing equipment pictures and the inside of the camp cars, it was time to move on. 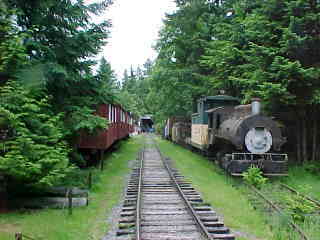 A special thank you to the Camp 6 Logging Museum for having us today and running a special train for our group. 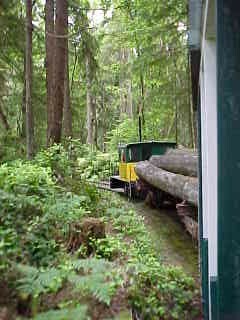 Elizabeth wanted to join us on our way to Battle Ground, Washington so I rode with her to there. We led the way with Jim driving Bob and Chris. 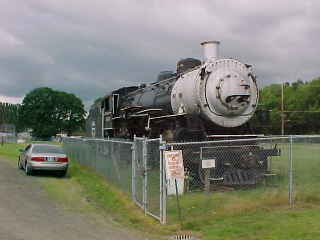 We took the Vader exit and went down to the track to take a few pictures of trains we hoped to see come through. 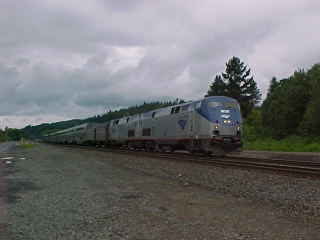 We caught the late-running Coast Starlight Train 11 speeding south. 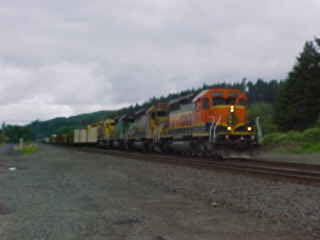 Later a southbound BNSF freight train. We then left Vader and headed to Battle Ground. 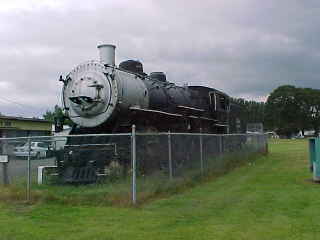 There we found Spokane, Portland and Seattle 2-8-2 539 on display. After we shot pictures, we all said goodbye to Elizabeth who headed back north to Lynnwood, while we headed to the Days Inn at 82nd Street and I-84 in Portland. Almost as soon as we got on I-205, the low fuel light came on. We made it to a Shell gas station at Sandy Boulevard where we put in $20 of fuel. Our rental car had a tank of gas prepaid, so we needed to return the car as near empty as possible on Sunday. With that done, we went to the Days Inn and checked in for two nights. After some rest time in our rooms, we walked over to Elmer's for dinner with me having Prime Rib. Bob, Chris and I then took the MAX Light Rail line to Lloyd Center. 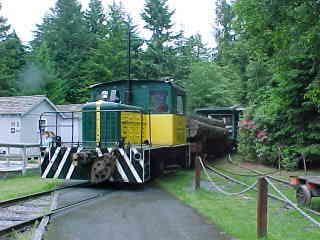 Here I checked Trainorders.com for any information on the Southern Pacific 4449 trip to Sherwood tomorrow. 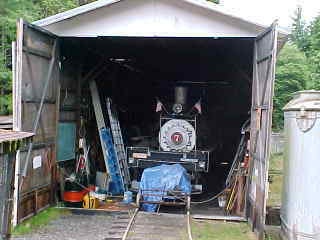 There was not anything there or on Southern Pacific 4449.com so I then took a long shot and checked my e-mail with no luck on that subject. 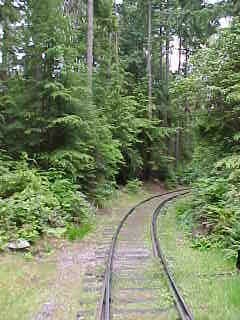 A walk to Radio Shack for more floppy disks, then I took Bob and Chris to Chinatown then gave them their first ride on the MAX Expo Line. We returned to the Days Inn where I watched the College World Series and saw Cal State Fullerton make a big comeback against Missouri in Game One of their best-of-three, before calling it a night.